1.5 billion speak English worldwide, with about 360 million of those people speaking English as their first language. You would expect a language that is spoken by around 20% of the world’s population to be relatively easy to learn, but as any ESL learner will tell you, it is not. Packed full of unpredictable spelling and tricky to master grammar, English can be a difficult language to master. As an ESL learner, building an understanding of why English is so tricky to master is the first step in getting to grips with it. Because English borrows words and structure from a variety of languages, such as French, German and Danish, it is often full of frustrating and illogical constructions. This creates a situation where the keywords used in everyday sentences will often make no sense from a logical standpoint. For example, “I get up and put my clothes on” uses the phrase “get up” instead of the much more sensical “stand up.” There also isn’t much logic in saying that you’ve put your clothes on, when they never get put off, only taken off. One of the primary rules of English spelling is “I before E except after C.” While this certainly applies to words such as “friend,” “fierce,” and “believe,” it does not apply to words like “receive,” “ceiling,” “receipt,” “weird” and “science.” Despite “I before E except after C” being one of the most commonly taught rules in English, there are more words in the English language that don’t comply with this precedent than actually do. As with many languages, the speech of native English speakers is full of idioms. By comparison to other languages, however, these idioms often make no sense at all, especially to a non-native learner. Expressions such as “It’s raining cats and dogs,” “turn a blind eye,” “fat chance,” and “once in a blue moon,” have very little obvious meaning when taken out of context. ESL students often complain that the number of culturally accepted idioms in English is one of the things that makes it so difficult to master. 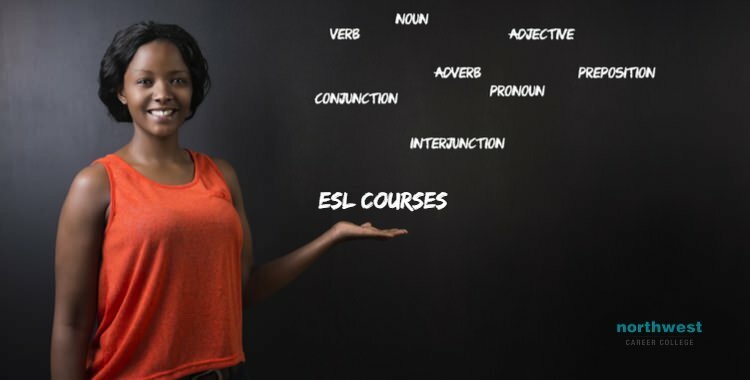 While English can be challenging to master, and it might seem like a daunting task as a new ESL learner, there is one sure-fire way to improve your language skills. Practice! Practice is also the only way to learn the parts of English with no apparent rules or that contradict the rules you’ve already been shown. It’s as easy as finding someone to talk to and starting a conversation. If you take the time to practice your English more than “once in a blue moon,” you’ll pick all its little oddities in no time. The benefits of taking an ESL course are clear. By improving your English skills, you gain better access to education, a better earning potential, a better social life and even better results from healthcare. We here at Northwest Career College are committed to enhancing our student’s lives, which is why we are proud to offer our ESL courses free of charge to our students, their friends and families and to the Las Vegas community at large. You are welcome at Northwest Career College. Our seasoned language teachers are experienced in working with international students from all over the world and are here to help you get the most from your classes. If you are interested in taking advantage of this excellent opportunity, then call one of our ESL councilors today on (702) 403-1592.